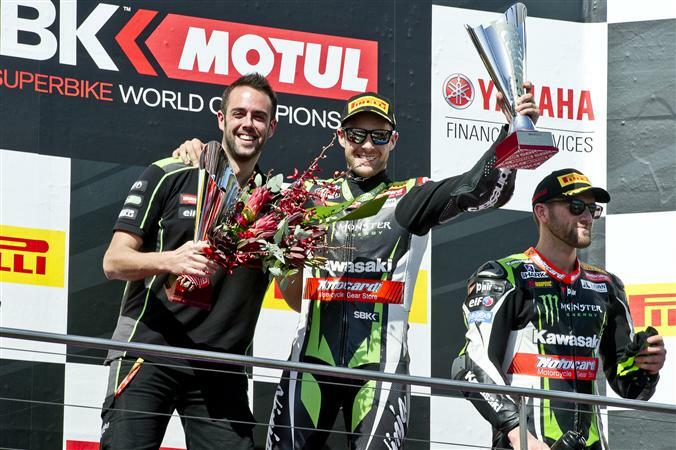 Defending champ Jonathan Rea (Kawasaki) got 2017 off to a good start by winning Race 1 of the opening round at Phillip Island Australia earlier today. Rea held off the rider who dominated the last part of 2016, Ducati’s Chaz Davies, who was just beaten to the line. Finishing third was Tom Sykes (Kawasaki). New Ducati factory rider Marco Melandri ran with the front group until he overshot a corner early in the race. Melandri re-joined the race in last place, but ultimately parked his bike in the pits and did not finish. American Nicky Hayden (Honda) brought his brand new machine home in 11th place. Wasn’t this supposed to be the year of the new Honda that was going to make them competitive again? Basically the same players as last year. At least it was competitive with 4 bikes finishing within about a second apart. Alex Lowes was right there with the usual suspects. I think that Honda is, well, keeping it simple to some extent. They are in racing and getting some exposure. We are talking about them right now for instance. Their street bike line shows a lot of innovative ease of use features and they still make a few sort of “will work pretty well and last forever” items in just about any market that they are in. I’ll bet those 500 twins end up lasting forever for instance. They remind be of the XR dirt bike like. Honda makes the small block Chevy of a lot of mechanical things. Chevy still makes the Chevy and now the LS. For a while the small block Chevy little car was a Honda. The CRF450 is the small block Chevy dirt bike. The Japanese were the Ferrari motorcycle manufacturers for a long time. Honda is making small block Chevys. If you want to sell a lot of something. Make the go to part. Suzuki already has the Hayabusa engine. Honda has the Wing engine, the ST engine, the 450, the CR500, the Civic, yadda yadda. They are doing all right. I hate them. But credit where it is due. me thinks as of M.Y. 2003 Honda is in a self-imposed “gentlemen’s agreement” with their fellow Japanese manufacturers. whereas in MotoGP they are clearly the engineering equivalent of BLOOD THIRSTY ZOMBIES. so instead of doing the same in production World Supers (which they could) they have instead made a conscious decision to give their fellow countrymen space to operate. Q: wait, so who’s the winner…? A: all those family and friends living on a rock in the middle of the Pacific. …and “shot his eye out”. Other riders have had success on the Honda, including Rea. It seems most comments here suggest Honda is to blame for Nicky’s poor performance. Could it be that Nicky isn’t the rider you think he is (was)? 2006 was a long time ago. his Sepang win was only 9 months ago. True, but it was in the rain. In race 1, he finished 8th. I’m just saying he hasn’t given his fans much to cheer about since his 2006 championship season. Compare Rea’s success in WSB on the Honda with his success on the Kawi. Funny, how the same rider who was an also-ran on the Honda became an all-conquering multi-time champion merely by switching rides. Rea finished 2014 with 9 podiums, 4 wins and a 3rd overall in the championship on a Honda. I think your definition of “also ran” is different from mine. There is no doubt this 2017 Honda is not competitive in its current guise. But winning races is a complicated affair. So complicated, in fact, that it is best to avoid reductionist reasoning when trying to justify unfulfilled expectations of a personal favorite (#69). It’s also best to avoid over-complicating things. Winning races these days in WSB is not all that complicated of an affair. Either you ride a factory Kawi or Ducati, or you hope for rain. Otherwise, you have no shot. hmmm sounds like MotoGP only with 2 different manufacturers. And some say WSBK is more competitive and fun to watch HA! Rea, in 2014, didn’t have to compete against two 2015+ Kawasakis. If those bikes had been in the field then, how many podiums would he have had? A year ago Hayden finished 5th in WSBK. So far this year he is 15th. I don’t think dropping 10 positions in a year can be chalked up to the rider. At least Nicky is the first Honda? If that bike doesn’t improve that’ll be all he can race for. An important point. Throughout Nicky’s career, he has almost always been on equal or better footing with his team mate, some of whom have since won GP’s or contended for the title. The bike has always been the biggest factor in holding him back. Maybe not the only factor, but definitely the biggest. Good race. Also glad that one of the commentators from last year–the one who’d get excited and start sounding like Kermit the Frog on speed–has apparently moved on. That was an awesome race. 6 riders leading at different times and we didn’t know who was going to win it ’till the finish line. 4 different brand bikes (Ducati, Kawasaki, Yamaha, MV Agusta) fighting for the lead. The Hondas weren’t really competitive yet. Honda provides Nicky with yet another “boat anchor”. Honda keeps proving they don’t really care about their production superbikes. The CBR1000RR needed a complete re-do, not the refresh it received, and it shows. More likely Kawasaki’s WSBK budget( and Ducati too) is the culprit. The chassis got a complete redo, it weighs like 30 pounds less now..Motor is still a dog for the top 1% of riders though. That’s been Honda’s M.O. for years now. Produce the best handling bike possible and don’t worry about the power. Problem is that now Nicky has another “also ran year”. He not a young pup, and Honda owes him a competitive bike. And MV Agusta knocked spots off them. Due in no small part to the heroics of Leon Camier, who is the over-acheiver of the group. He sorely deserves a podium at some point.